As a Columbus criminal defense attorney, Probst Law Office places a high priority on helping our clients understand the criminal defense process. After all, knowing the process can not only help to alleviate your nerves, it also equips you with the knowledge you need to better work with your defense attorney. That’s why we’re starting a series of posts on the criminal defense process. Our attorney, Michael Probst, believes finding competent and skilled legal counsel shouldn’t be difficult. After all, there’s so much to deal with when you’re facing criminal charges. 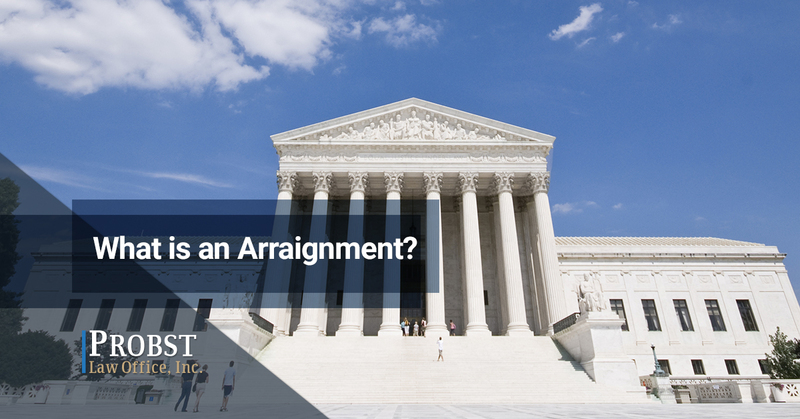 In our first post in this series, we’re going to talk about arraignments. This is usually the first part of the criminal defense process that actually occurs in front of a judge. The primary purpose of an arraignment is to give the person who is accused of a crime a formal reading of what they are being charged with. During the arraignment, the accused will also be asked what type of plea they want to enter into: guilty, not guilty, or no contest. This is also the part where the prosecutor decides whether or not they are actually going to try your case, depending upon how you plea. An arraignment may not seem like a big deal, but there’s actually a lot of important stuff happening. At the arraignment you and/or your attorney can learn about the prosecutor trying the case or future dates for pretrial hearings or the trial itself. It can also give the defense an opportunity to make a good first impression — or leave a bad one. What are the Benefits of Having an Attorney During the Arraignment Process? Your defense attorney will be able to tell you whether or not your rights as the accused were violated during any part of the process. The importance of this cannot be understated. If you are robbed of your rights during any part of the process, your defense attorney can use this to reduce the sentence or get the case thrown out entirely. During certain cases, your counsel is also able to appear on your behalf during this portion of the process. However, it’s important to talk to your lawyer to ensure this is the case. While there are few things more important than finding a solid, knowledgeable defense attorney, it shouldn’t be a difficult process. At Probst Law Office our attorneys are here to help you through the entire legal process, including arraignments. If you or someone you know is facing criminal charges, contact the Michael Probst Law Office as soon as you can. We’ll be there for the entire process.